We can use behavior analysis from hybrid-analysis. Seems like there is no known protection mechanism. NtAllocateVirtualMemory, NtUnmapViewOfSection, CreateThread, WaitForSingleObject, LoadLibraryA, HeapAlloc, RtlAllocateHeap, RtlDecompressBuffer, FlushInstructionCache, NtGetContextThread. 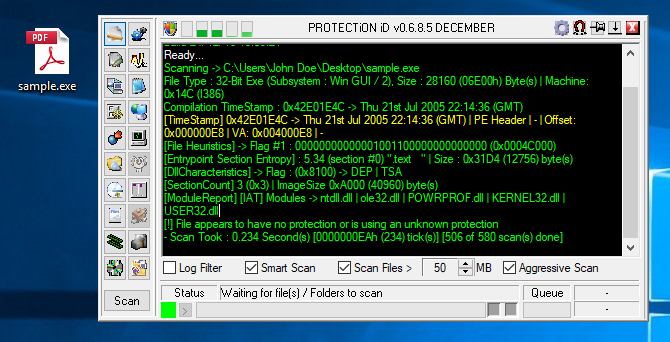 The decryption routine is used heavily by malware in different places to get plain text. 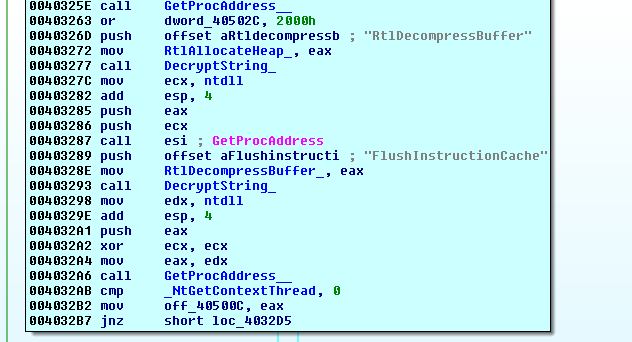 Main work starts inside the thread at 00403900, Where it decryptes and gets addresses for several Win API functions: CreateProcessW, ExitProcess, NtWriteVirtualMemory, NtSetContextThread, etc. There is one interesting anti-debug trick, at the start, it saves PEB and uses BeingDebug value [PEB+2] in XOR decryption routine, outside of a debugger this value is 0 and adding 0 don’t cause any error, but if we try to add 1 (which is the value of [PEB+2] if the executable is inside a debugger) it may cause error. In this case RtlDecompressBuffer returns 0xC0000242(STATUS_BAD_COMPRESSION_BUFFER) error. The reason of this error is that before calling RtlDecompressBuffer, malware decrypts(with XOR) decoded strings using 0x4C+[PEB+2] which is 0x4D inside a debugger instead of 0x4C, because of this result is corrupted output. 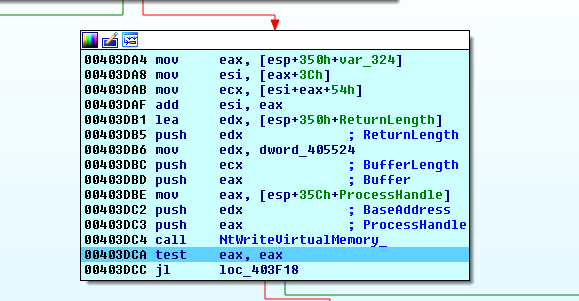 We can use ScyllaHide plugin for IDA to defeat this anti-debug method. Close IDA and start analyzing of the child process. This process is exactly same as the first process, creates a new process and injects decoded and decompressed code. 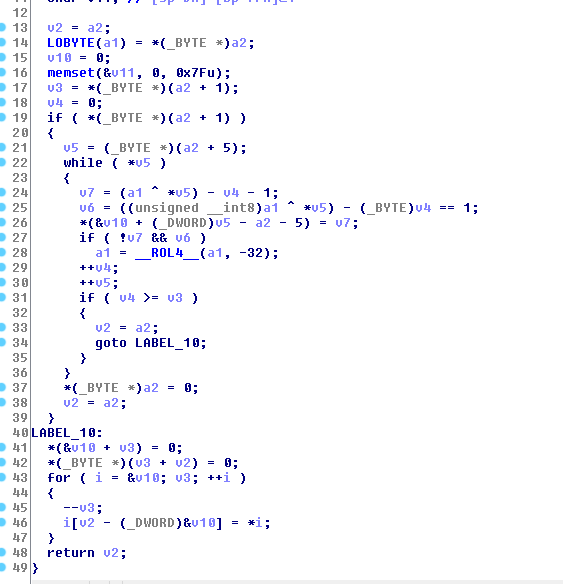 Let’s reverse last part (injected code) a little bit higher level. It tries to download questd.pdf from http://penangstreetfood.net/wp-content/uploads/questd.pdf and http://yumproject.com/wp-content/uploads/2014/11/questd.pdf without success. Sends GET requests to 95.181.46.38 with client related information, last string derives from victim’s IP address, B is instead of . That’s all… Upatre’s main function is to download malicious files. I know, I overlook many things related to Upatre, due to my limited knowledge, if you find something interesting please contact me. I’m new to reversing malware and any kind of feedback is helpful for me.